Getting married does many things to many people. One of the things it also does is teach one the love of cooking. And one such person who falls into this bracket is my kitchen allergic sister. I find it quite intriguing and interesting to observe someone who used to run miles away from the kitchen cooking up delicacies (certified by the brother-in-law), all amidst writing entrance exams and filing for applications to universities abroad. I guess nurturing the people you love is a common trait inherent in us created beings, and is there a better way to demonstrate this aspect than to feed someone you love with your very own creation? I was particularly happy when she cooked this up and got rave reviews from her family, in-laws and her brother-in-law included. Although I’m yet to taste the food cooked by my sister, I go with what her family says until the day I can sit relaxed at a table and she makes something especially for me. Until then dear sister 3 cheers to your kitchen ventures! Pasta with tomato and basil sauce was not to make an appearance on my site now but for the insistence of my sister who perhaps has been wanting to make this. 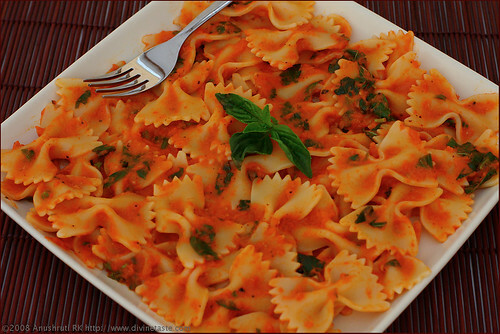 Tomato and basil sauce was one of the first pasta sauces I started to make for pasta. And considering the fact that Ro can live off pasta, I have made a number of sauces to date. And while we are on the subject of marriage and cooking, I must state that Ro is one of those people for whom this institution has not even remotely ignited the passion for the kitchen fires! And to this day I wait patiently until I can indulge in some leisurely activity while he rustles up something in the kitchen for me! This is a very simple sauce with basic flavours. 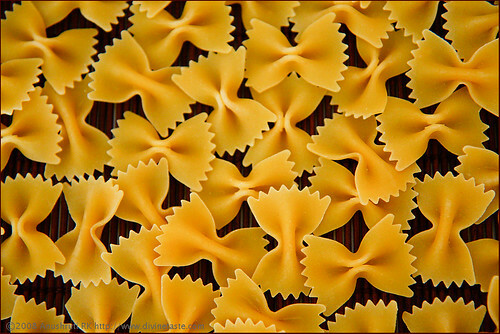 I usually make this with farfalle pasta, which I find holds the sauce quite well. You might use any other pasta of your choice. Put the pasta to boil in salted water, according to packaging instructions. Heat the oil in a heavy pan over moderate heat until hot but not smoking. Add in the tomato puree, along with the chopped basil leaves and cook for 4 to 5 minutes. Season with salt, sugar, pepper and paprika flakes. Lower the flame and mix in the cream. Turn off the heat and mix with the cooked hot pasta. Serves 4 if served with a salad. I sure agree with you. The way to a man's heart is through his tummy! And i have always believed that the best ingredient you can add to your cooking is 'love'. It always tastes better! and looking at your pictures i can say that a lot of it went in there..(dont see it in the ingredients though..haha) lucky Rohit! Thnks a ton for the recipe. Finally I get it. Yay! Will be sometime before I try this out. But surely, my interest in cooking seems to be triggered by Mihir but inspired by you… 🙂 no denying that!! Anu..you have a beautiful blog here…great pictures!…will be back to check more!..Have a great year ahead! Soumya: You are so right! Srivalli: Glad you enjoyed my site. Look forward to seeing you here. New year wishes to you too. Soma: Thanks and wish you the same. Yummy post! I miss these things now..don't know if we can find pesto sauce here in India. Do you make that too? Yes I do a pesto sauce too, will post it later. You can find ready made pesto sauce in most well-stocked stores in Bangalore, if you are looking for it, although nothing can beat freshly made food. I like the idea of adding a little cream. This sounds like a great recipe. I use crushed tomatoes, basil or oregano, red pepper flakes, salt, and a little sugar in my tomato sauces. There are women who give up promising careers for their husbands, as they want them to shine. Thanks for your comment. divinetaste is a site on food and topics related to or pertaining to food only are discussed here. Ashwini: Thanks. I'm so happy you are enjoying this site. It is for people like you and words like yours are an inspiration to keep going. You should get basil leaves easily in B'lore in many places and Namdhari for sure. Can you help me with the recipe of Lemon rice? Have not made it any time so needed help with it. What kind of tomato puree have you used? Fresh tomatoes, crushed in a mixie or something else? NSJ: Yes, fresh tomatoes crushed in a mixer. Love your recipes they're just the BEST!! Wanted to ask you if I could try this sauce on pizza too.. Should be fine, right? Except the cream bit of course! Let me know soon pls! And I'm going to try this baking this pasta, with a layer of cheese sprinkled on top! Will let you know how it turns out! Delicious pasta. We njoyed it . Pls share pasta in lemon sauce receipe. you have forgotten to say what to do with the olive oil. its in your ingredient list but not in the instructions. Oh sorry. Its there and i have not seen it.